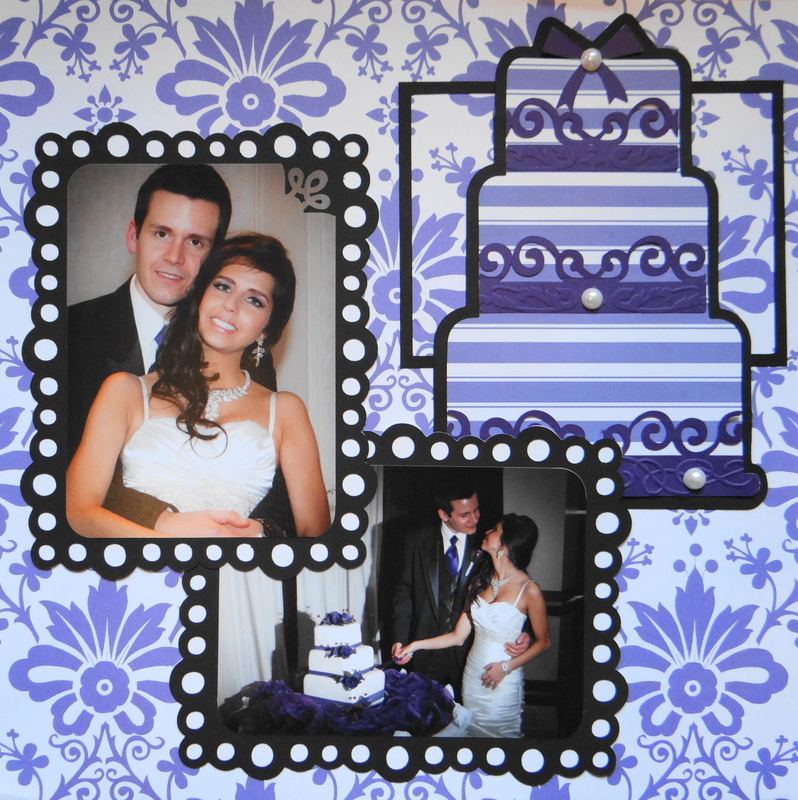 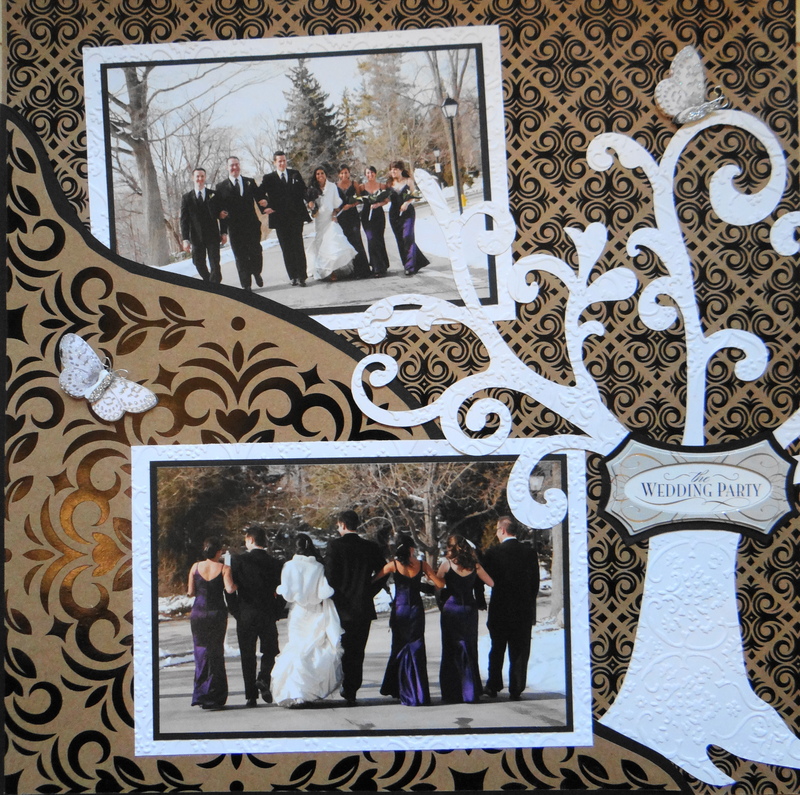 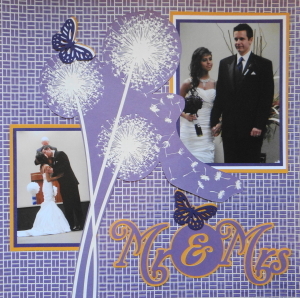 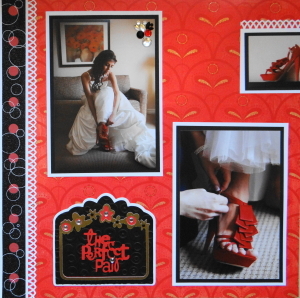 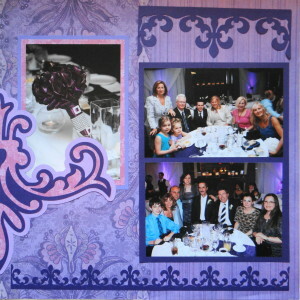 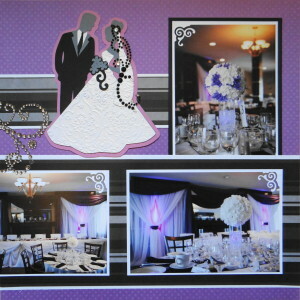 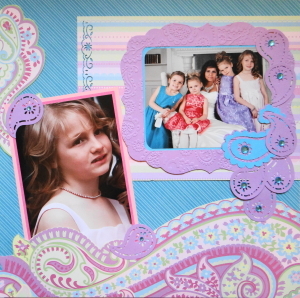 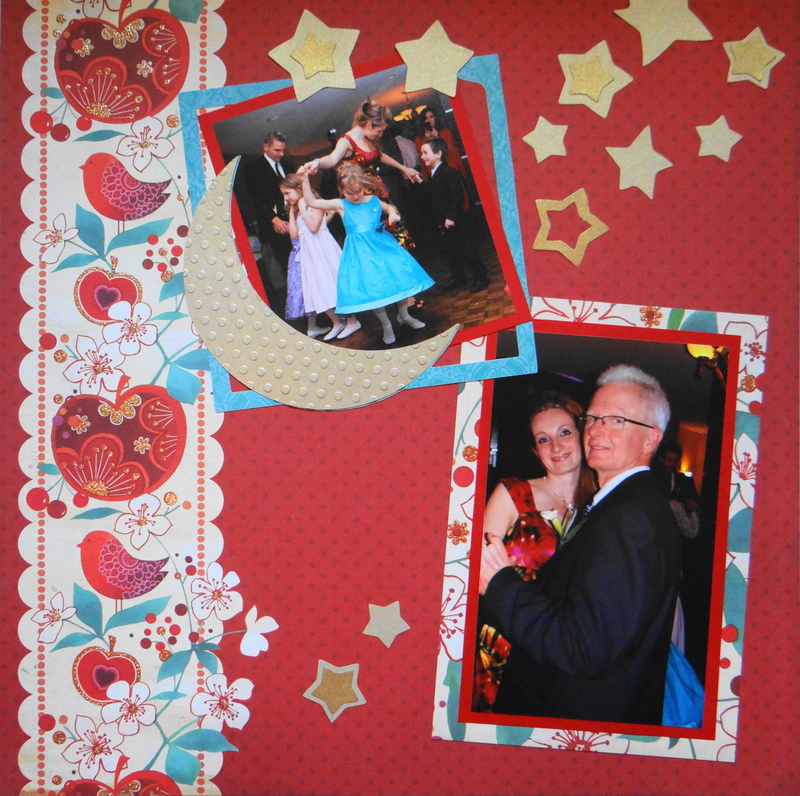 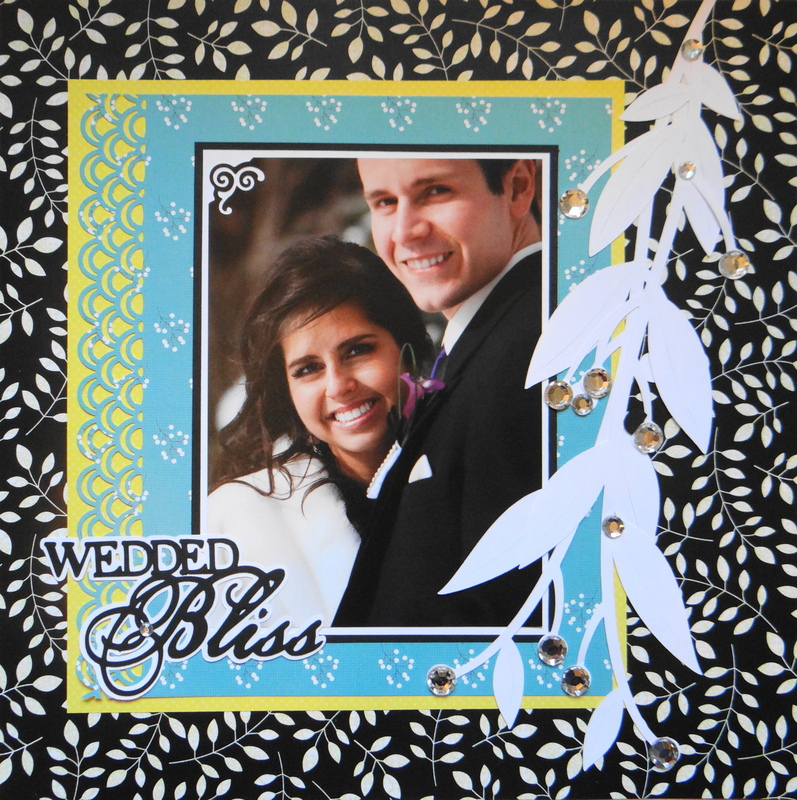 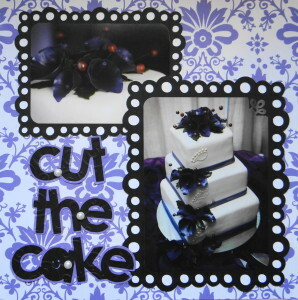 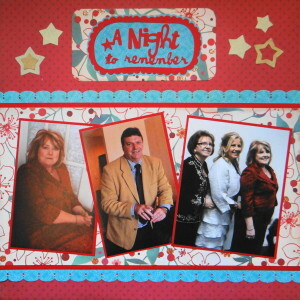 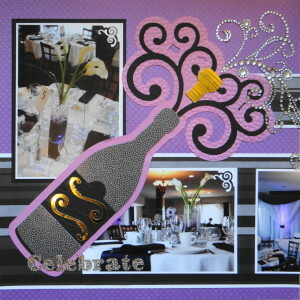 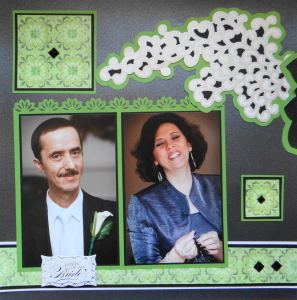 You will find wedding scrapbook ideas for your own pages in this large wedding album that tells the story of the whole day. 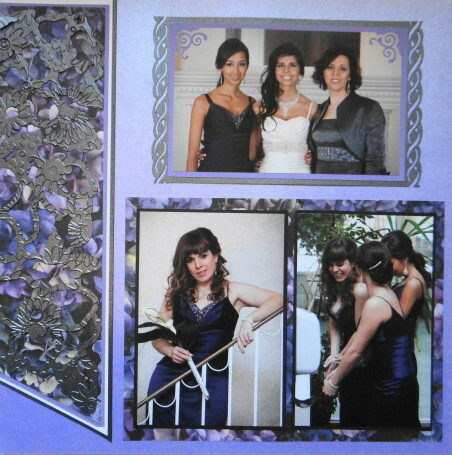 Inspiration: The purple Bridesmaid gowns and charcoal Mother of the Bride dress. 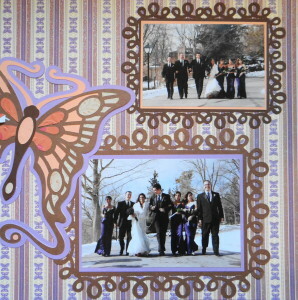 Inspiration: I have been saving this peacock paper for just the right photos. Inspiration: The bride’s gorgeous red shoes! 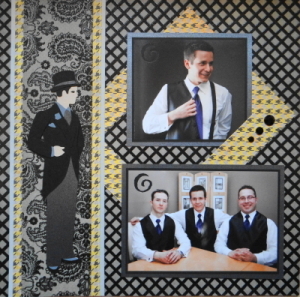 Inspiration: The masculine houndstooth check print coordinated with the only other colour in these photos- the gold toned wood table in these photos of the groom and the ushers. 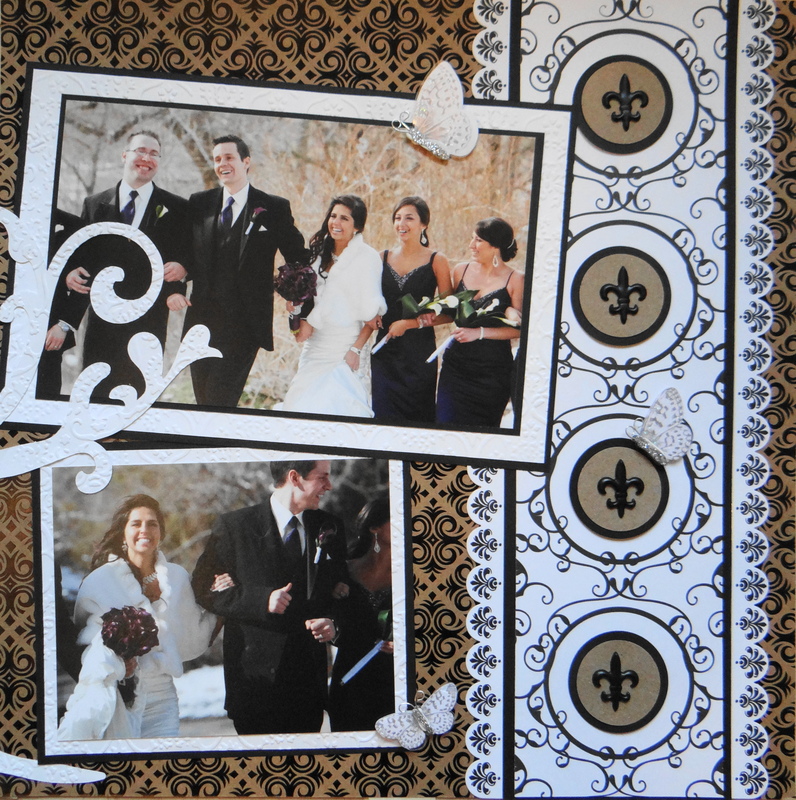 Inspiration: The gold band on the bride’s wedding dress. 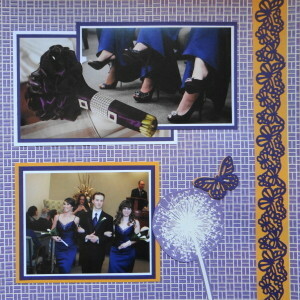 The peacock feather scrapbook paper is from DCWV Royal Garden Stack. 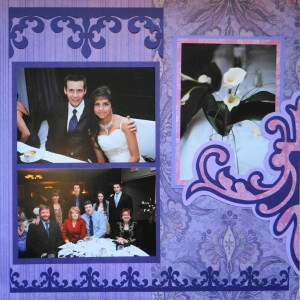 The frames on these pages are from the Cricut cartridge Elegant Edges. Inspiration: The bridesmaids purple dresses. 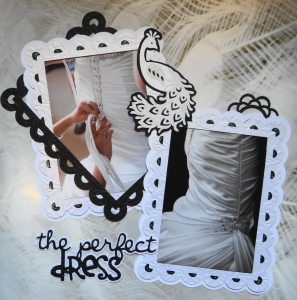 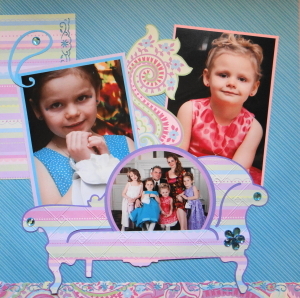 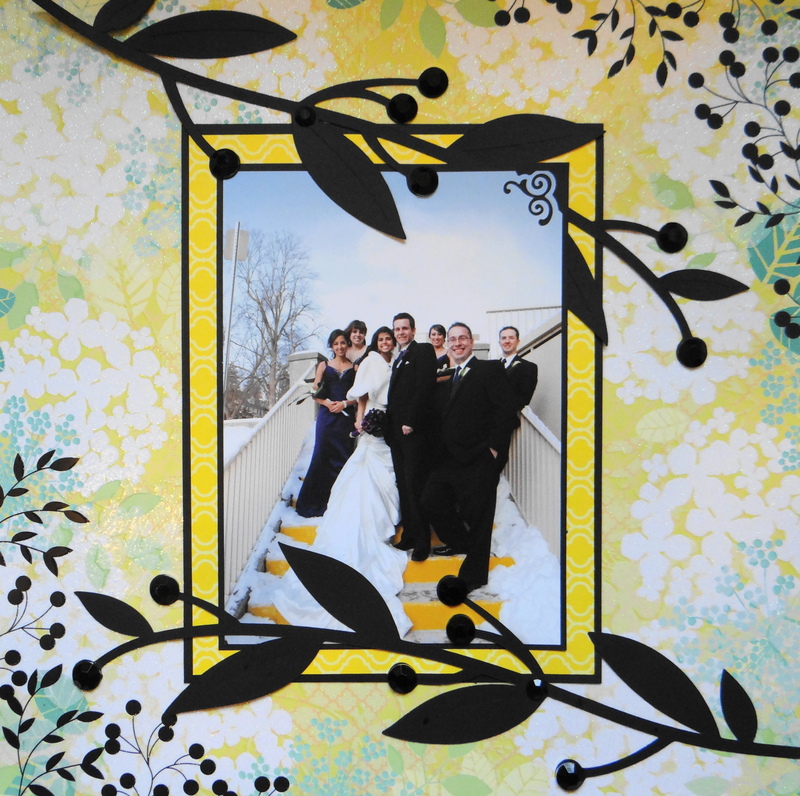 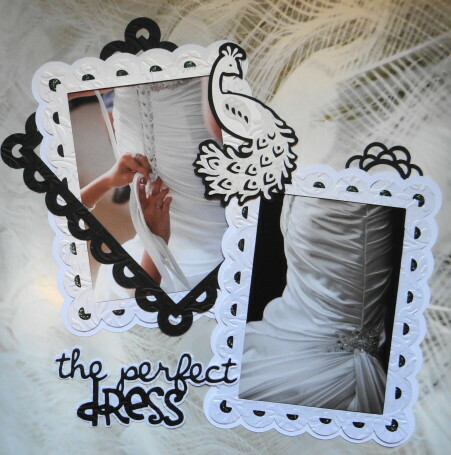 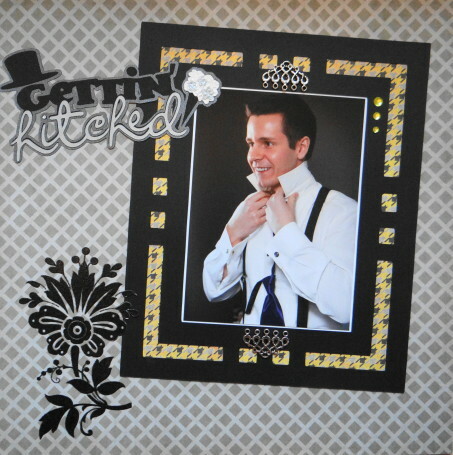 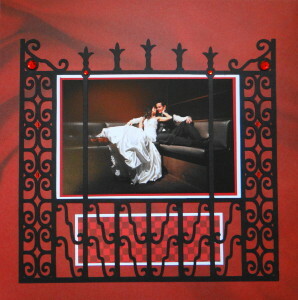 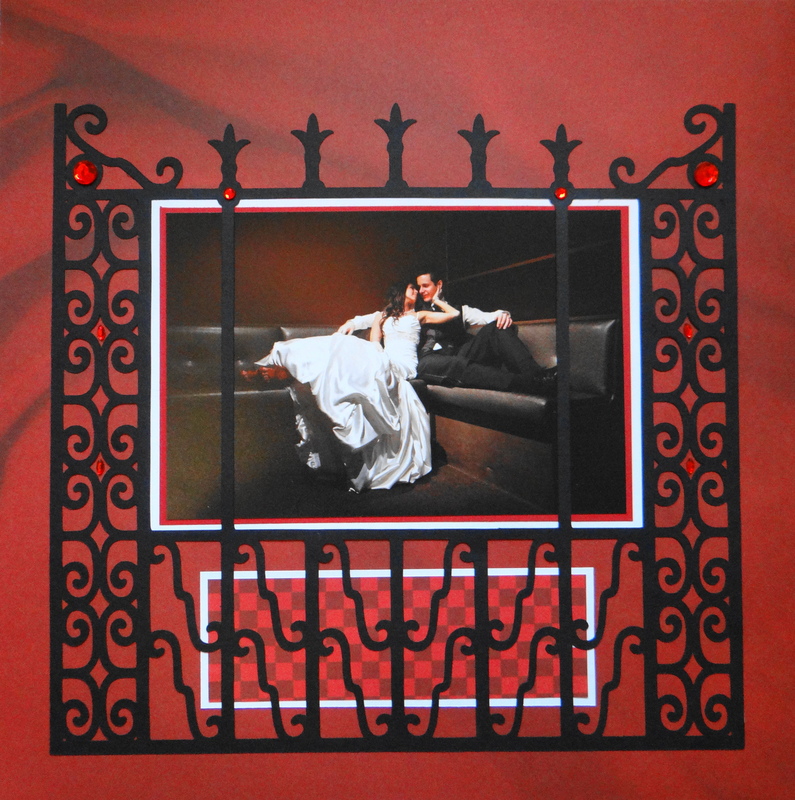 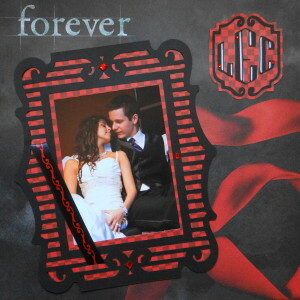 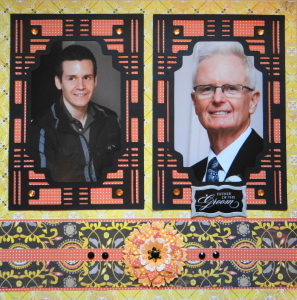 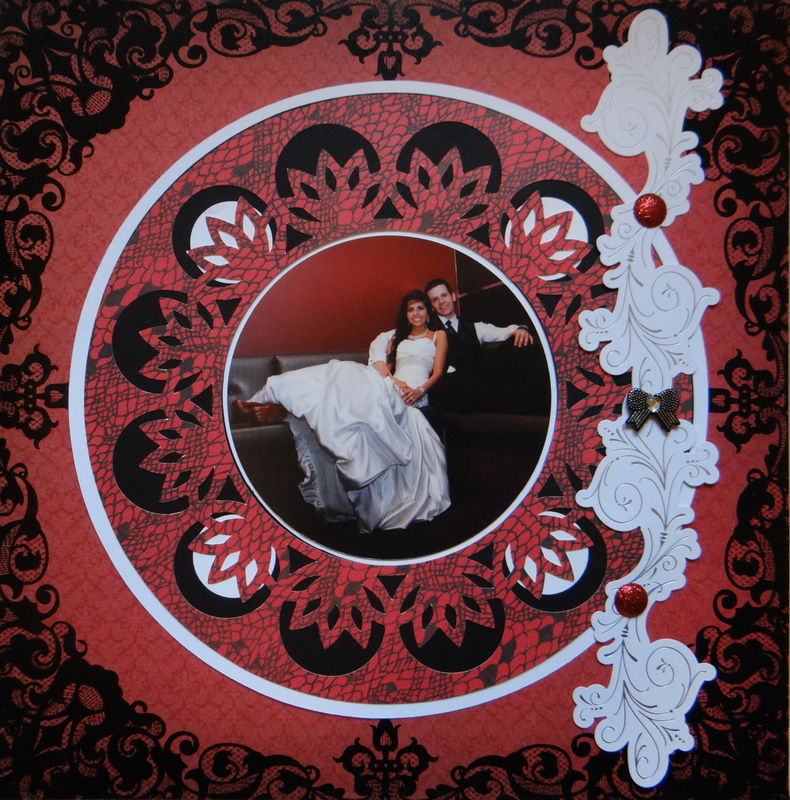 All of the frames on these pages are from Cricut”s Formal Occasions except the oval. 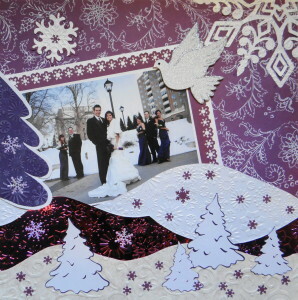 That is done with Creative Memories oval cutting shape. 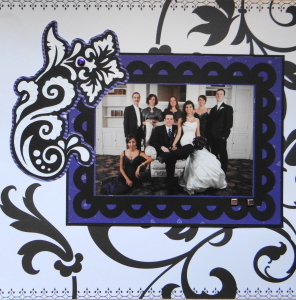 I then double matted the simple black and white border to enhance it. 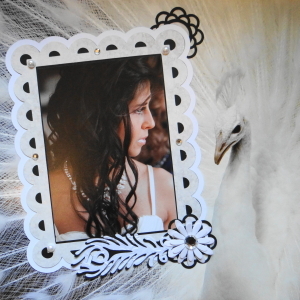 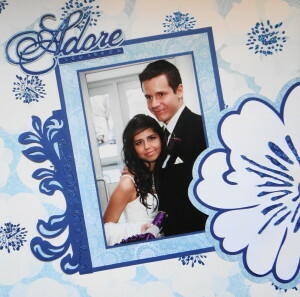 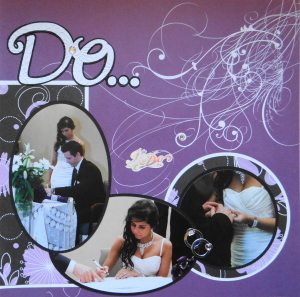 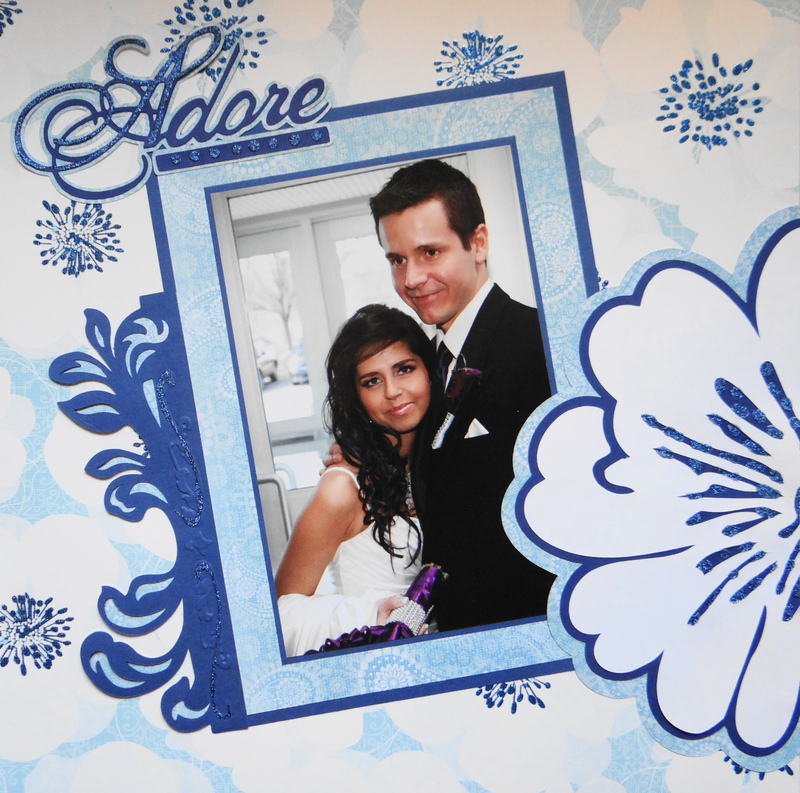 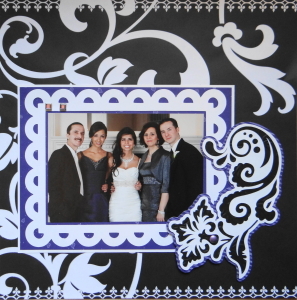 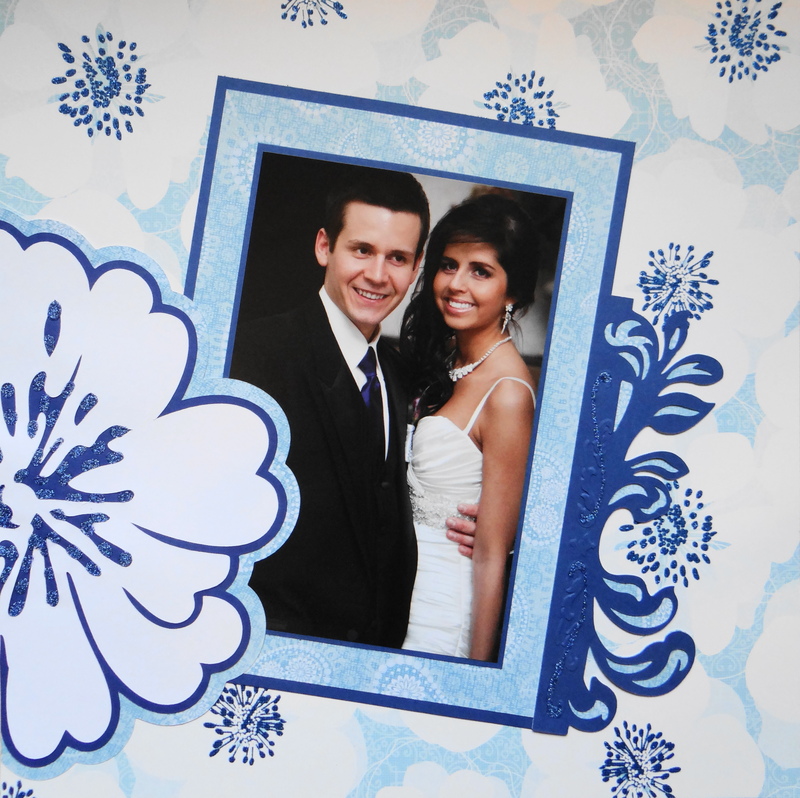 I used white matting to make the bride stand out. 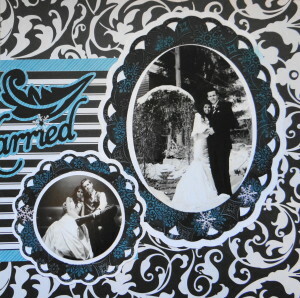 The background scrapbook paper is from DCWV Neon Chic Stack and the black & white paper is from Recollections Pattern Paper Stack. 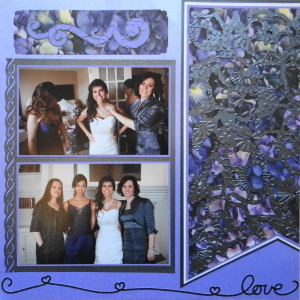 Inspiration: I wanted to place the pictures to look like a procession of the bridesmaids down the aisle. 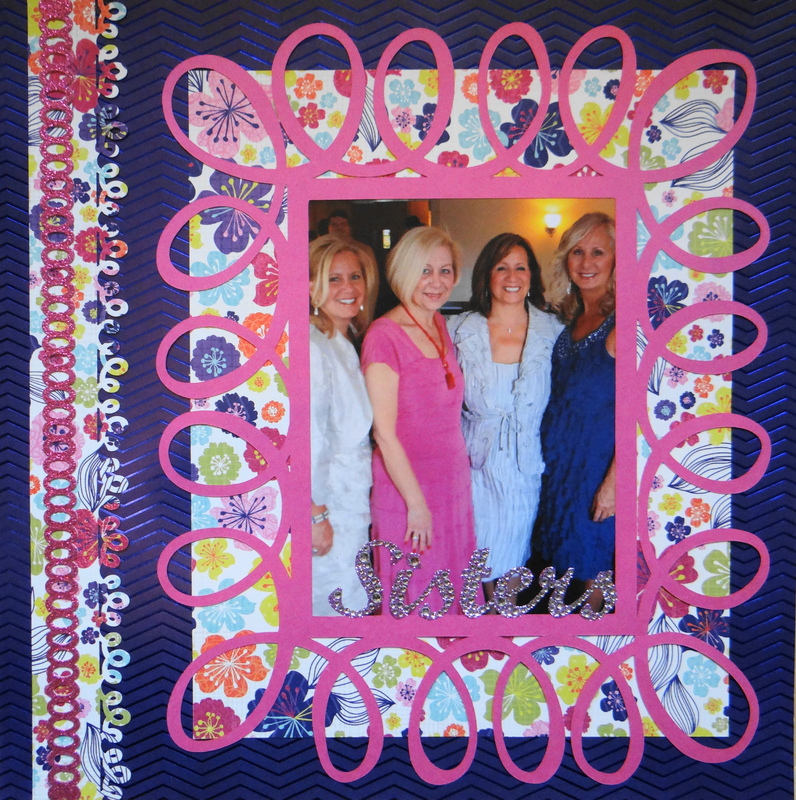 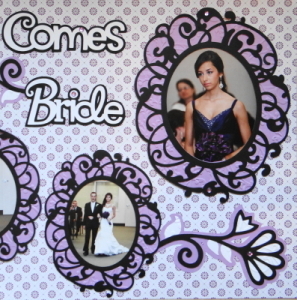 All the frames are from Cricut”s Fancy Frames. 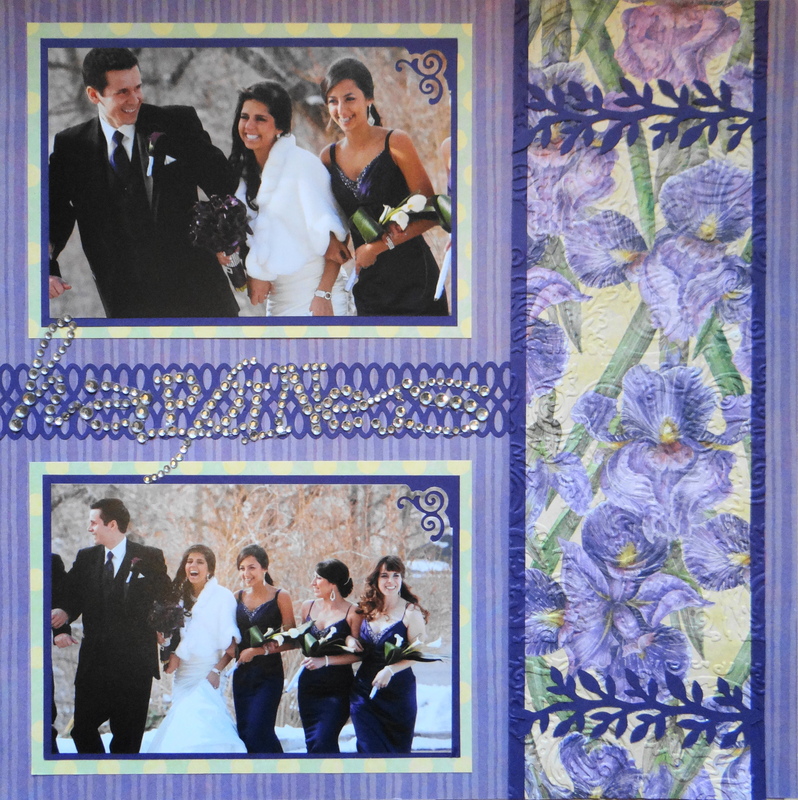 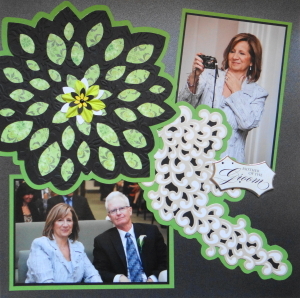 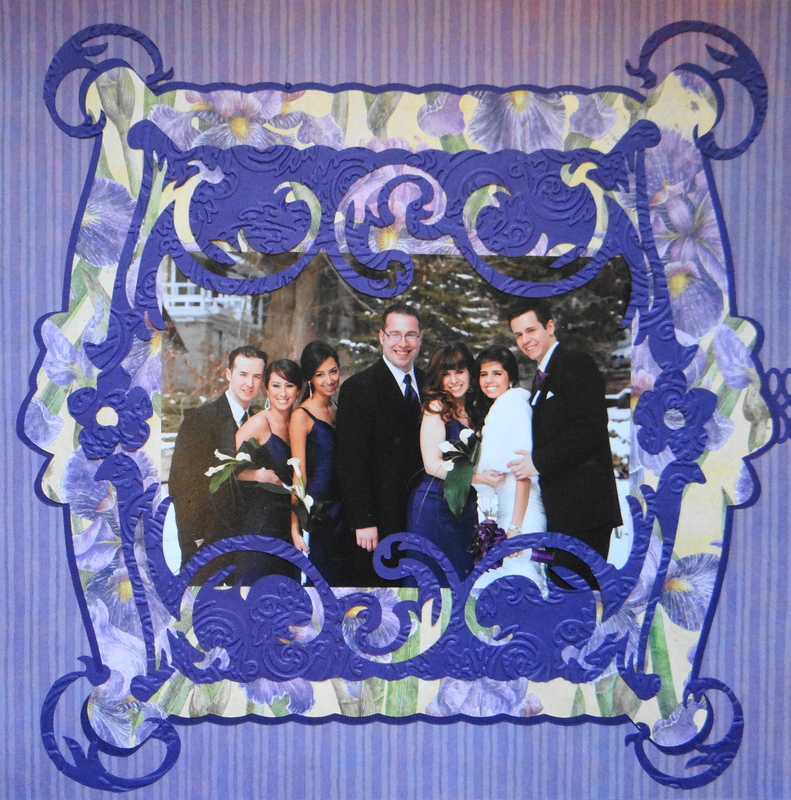 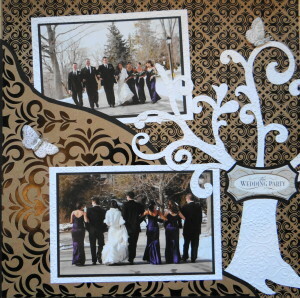 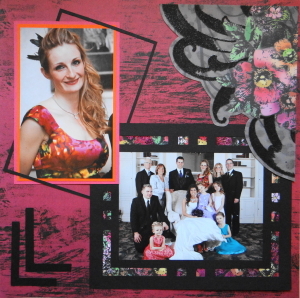 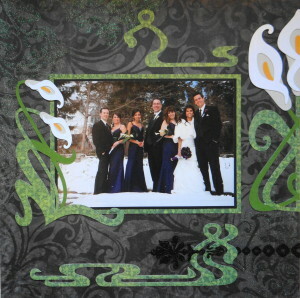 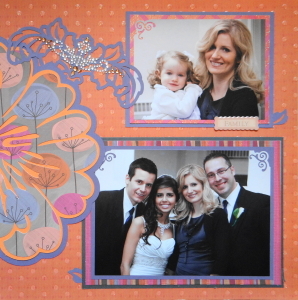 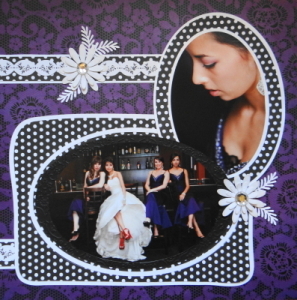 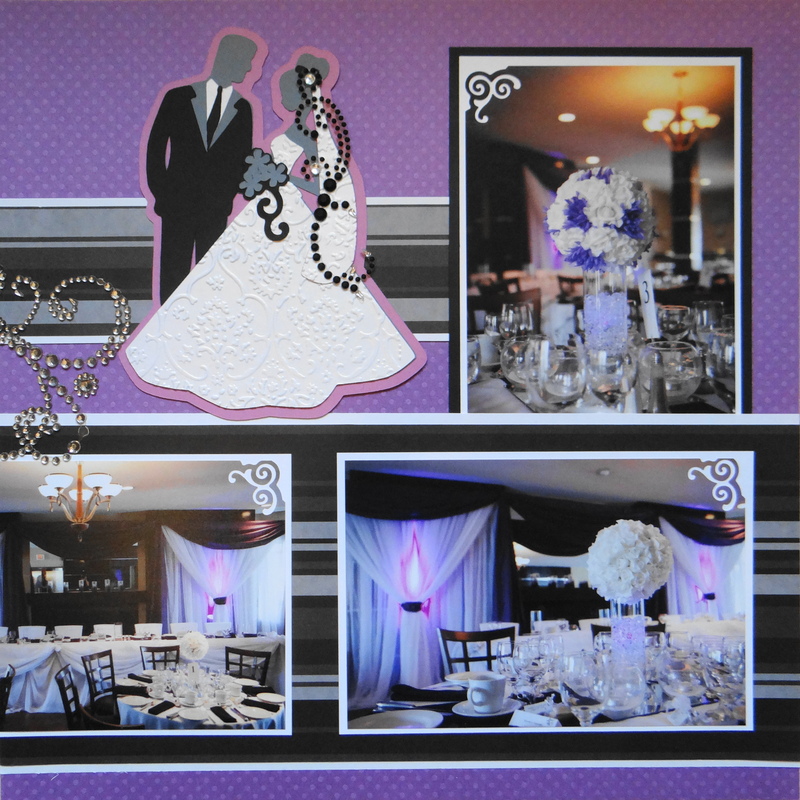 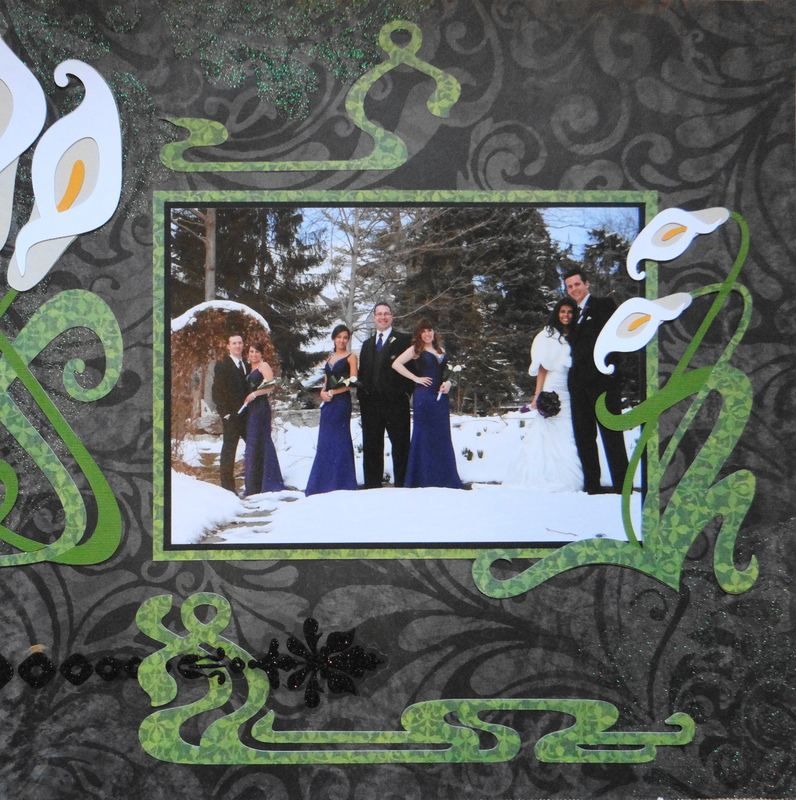 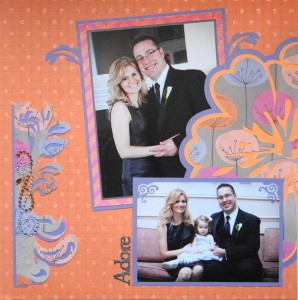 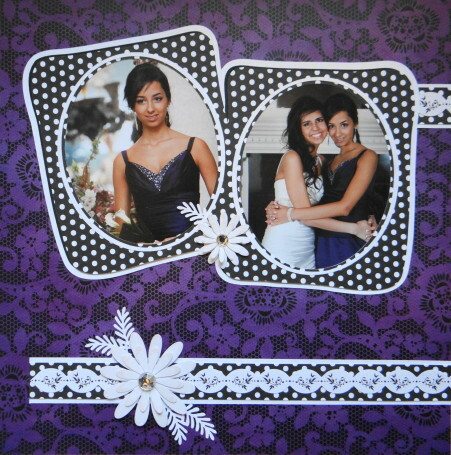 The bride image and the flowers are from Stretch Your Imagination. 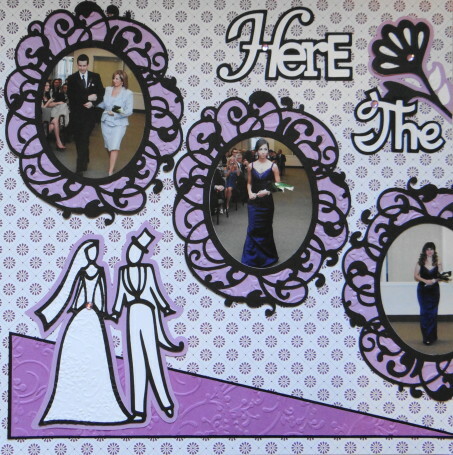 The title ” Here Comes the Bride” is from the Sweethearts cartridge. Inspiration: The purple bridesmaid dresses and the bride’s wedding gown. 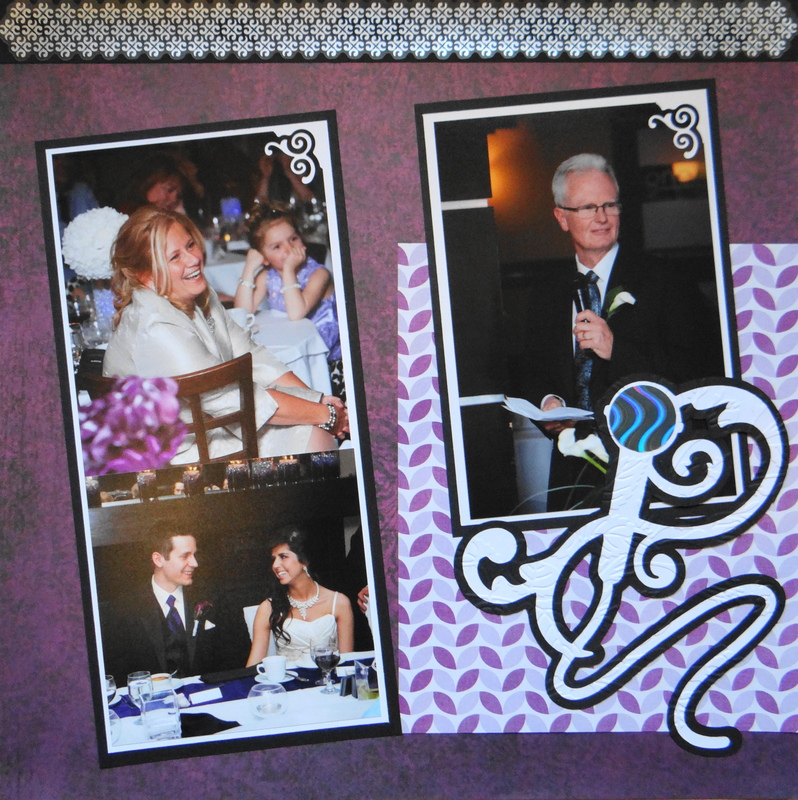 Inspiration: The boutonniere and the iridescent charcoal of the Mother of the Groom’s dress. 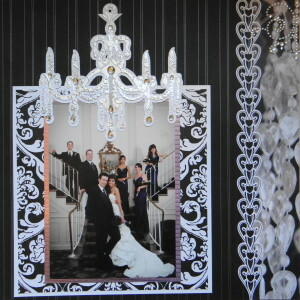 Inspiration: This grand staircase needed a chandelier. 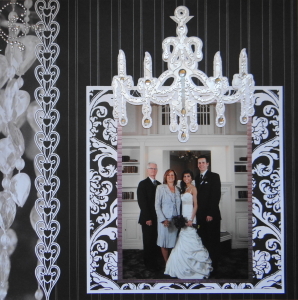 Inspiration: Black & white photos. 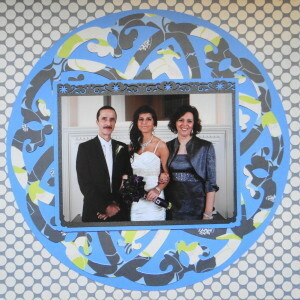 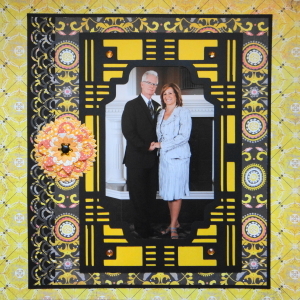 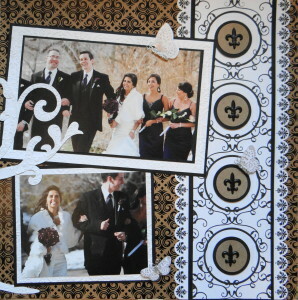 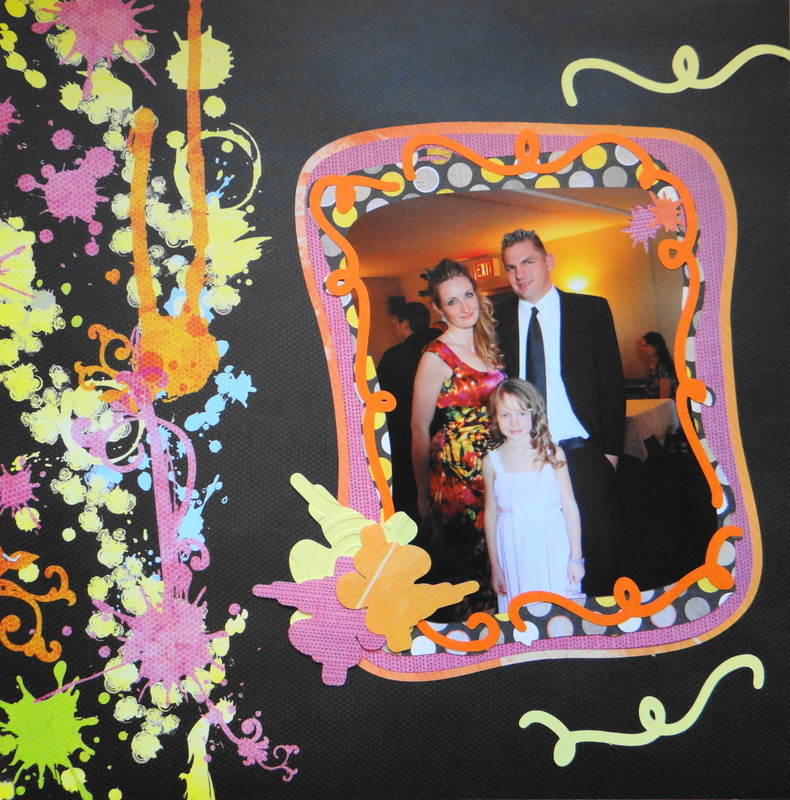 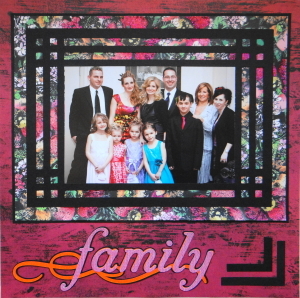 Inspiration: The bold print on my niece’s dress in these family portraits with the Bride & Groom. 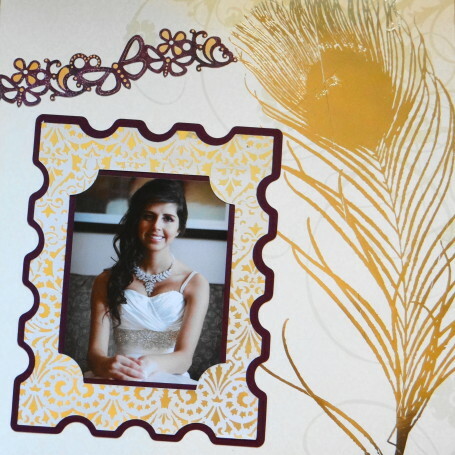 Inspiration: The peachy tones of the couch and this colour really warmed the skin tones of my fair niece. 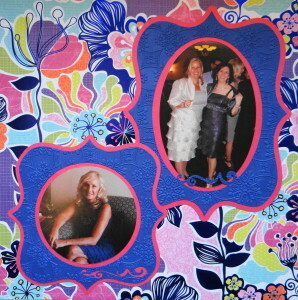 Inspiration: I wanted to find a feminine print with all the girls dress colours. 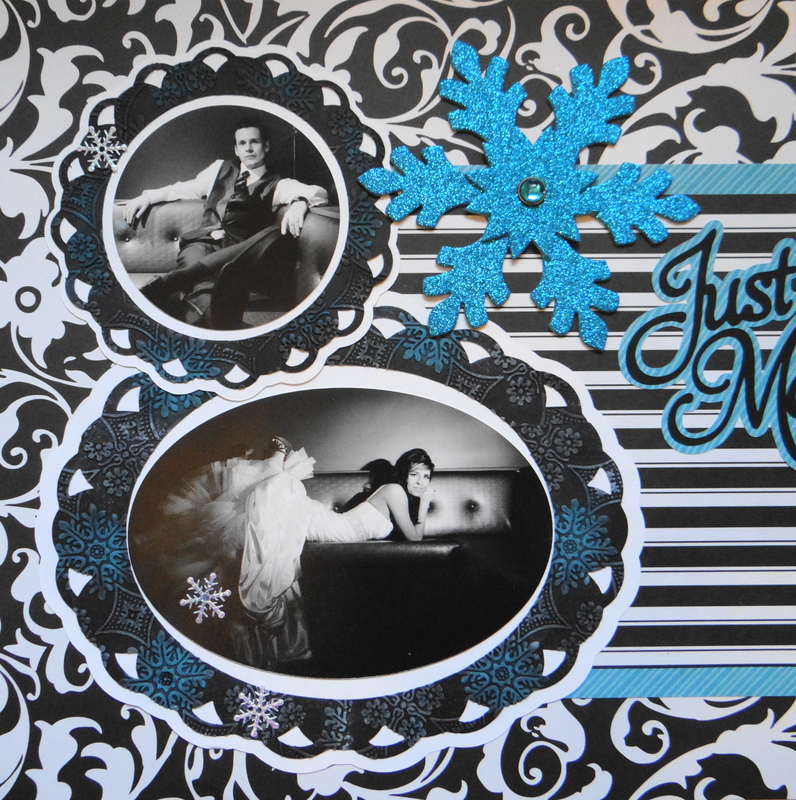 Inspiration: The masculine feel of this paper. 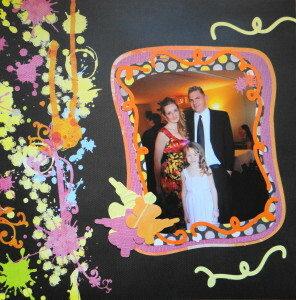 Inspiration: My niece’s gorgeous dress. 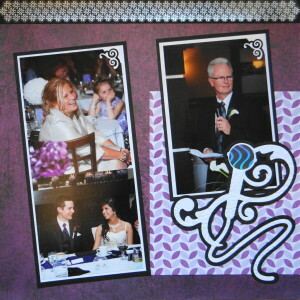 Inspiration: The animal print on the couch that the bride is laying on. 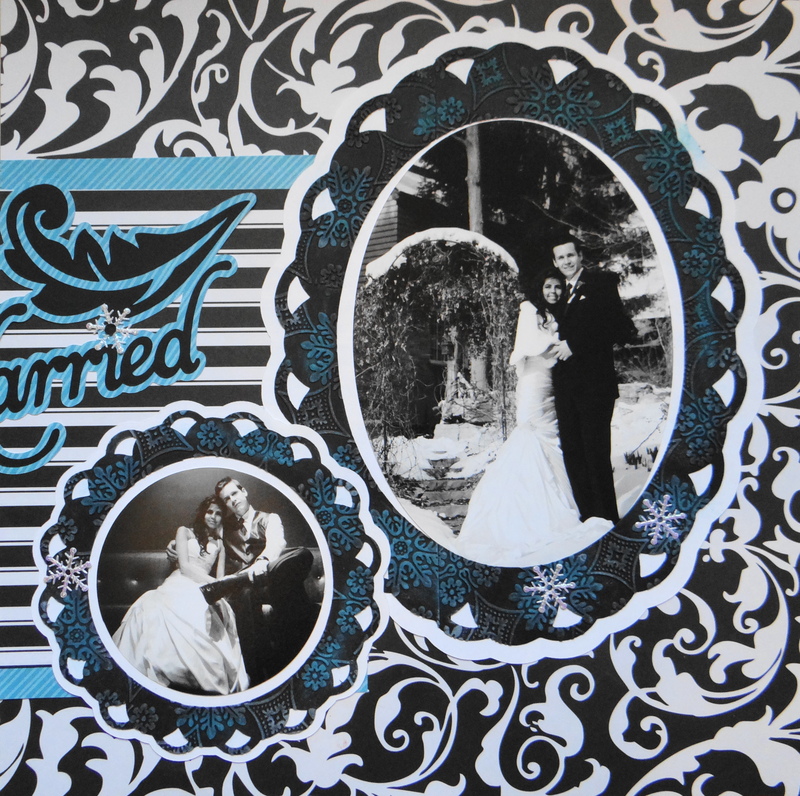 Inspiration: The black & white photo of the bride & groom in the snow. 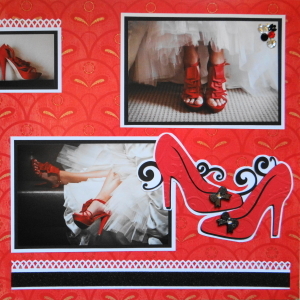 Inspiration: The love, the red shoes and the ribbon on the paper. 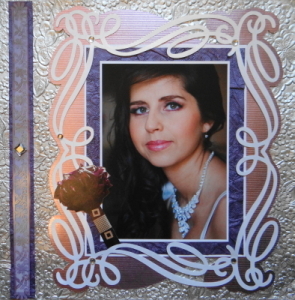 Inspiration: I looked through the album so far and had not done many pages in blue so this is it. Inspiration: The purple bridesmaid dresses and the white wedding gown. 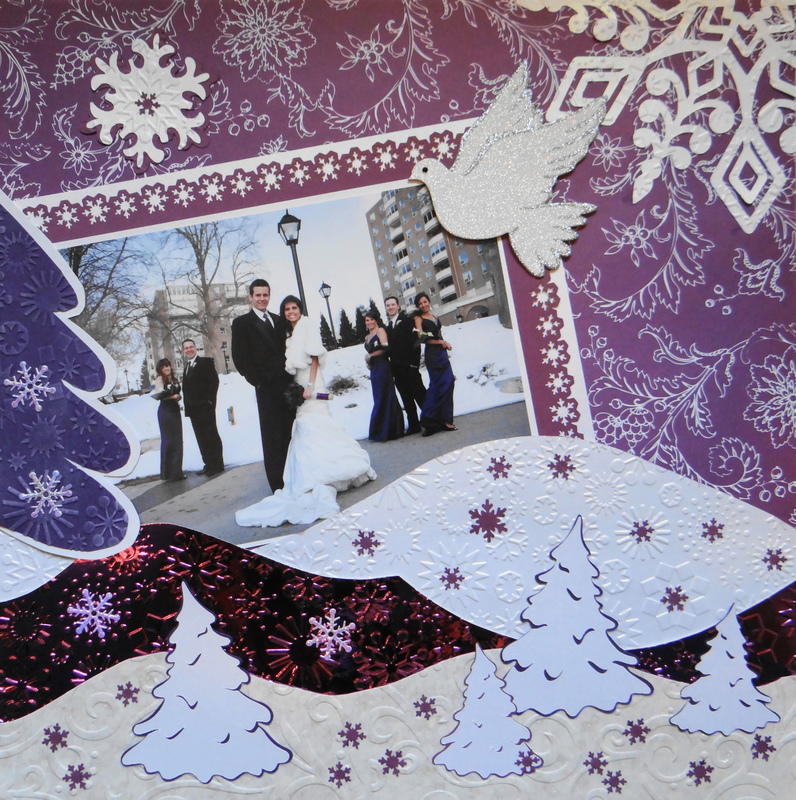 Inspiration: The colour of the trees in the background. 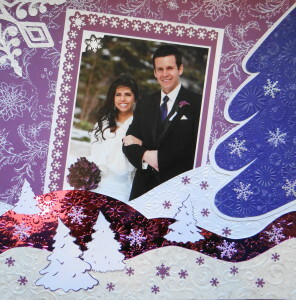 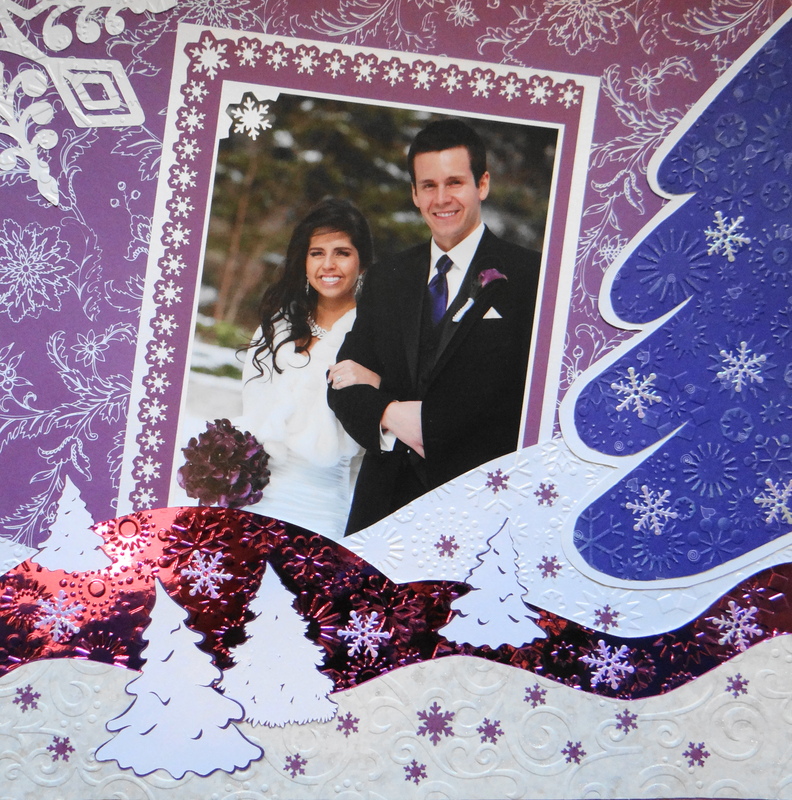 Inspiration: The snow outside at this winter wedding. 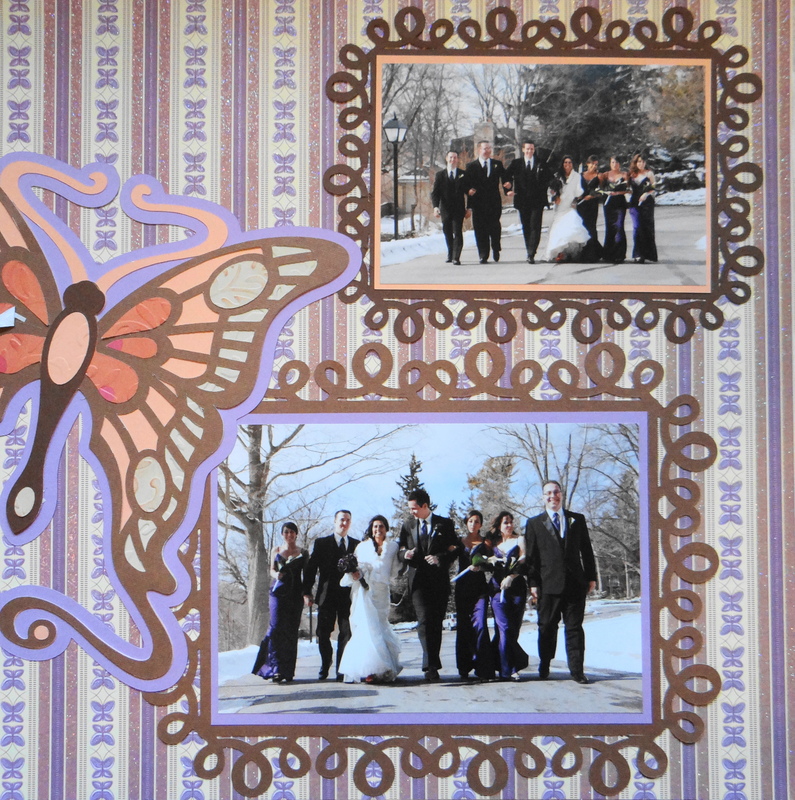 It was actually -12 degrees C. and the bridesmaids were outside without coats for so long. 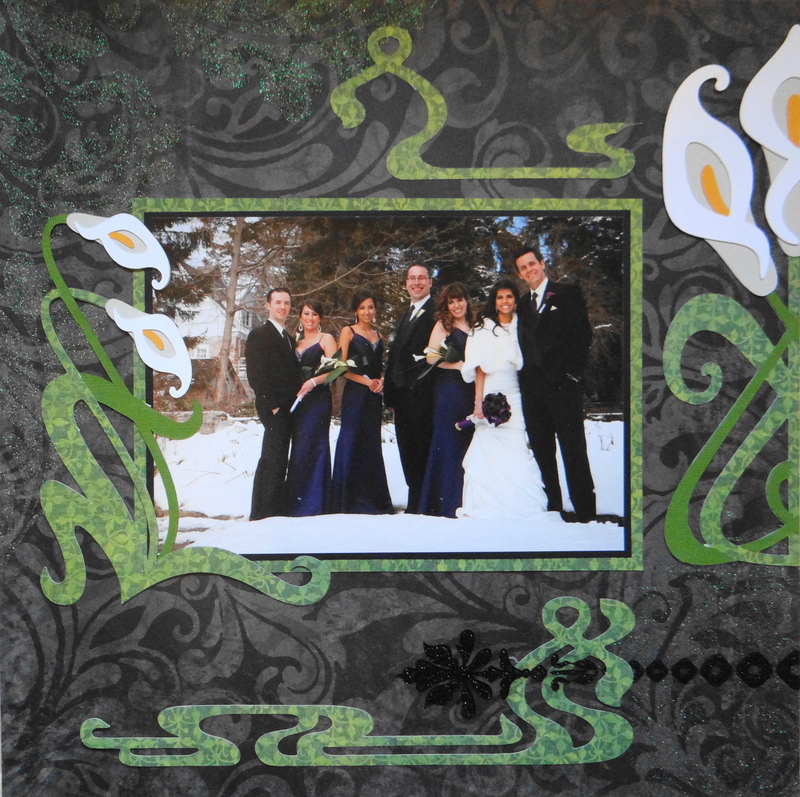 Inspiration: The bridesmaid’s calla lily bouquets. Inspiration: The groom’s purple tie and the bridesmaid dresses. 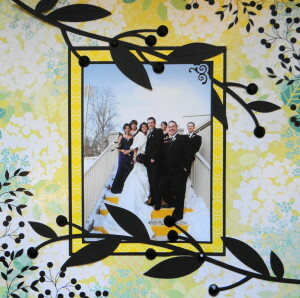 Inspiration: The yellow steps and the bright blue sky dominated this photo. 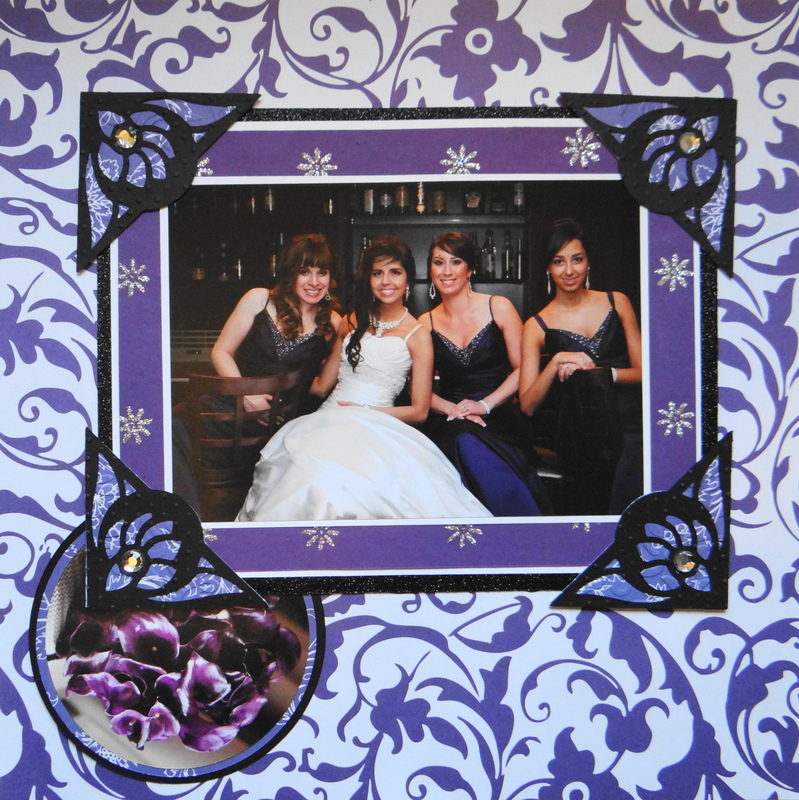 Inspiration: I am using every purple paper that I have! 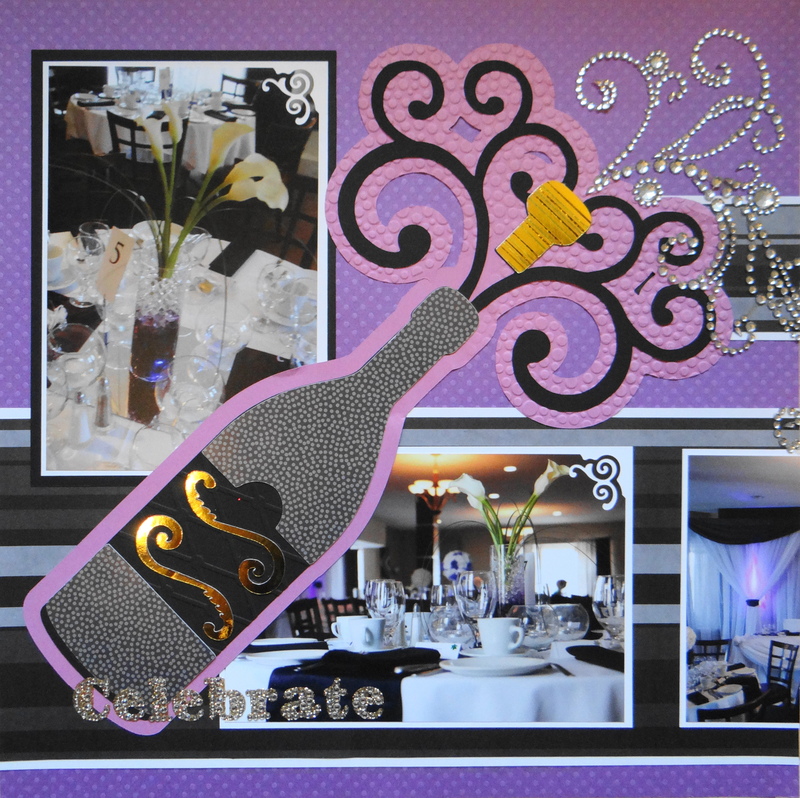 Inspiration: The reception made me think of the champagne. 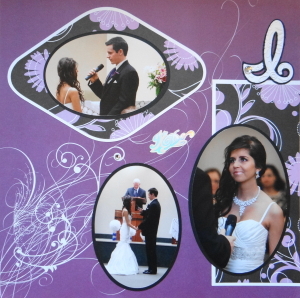 Inspiration: Everyone is holding a microphone to give their speech at the reception. 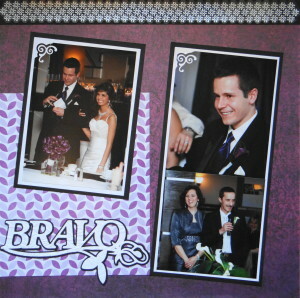 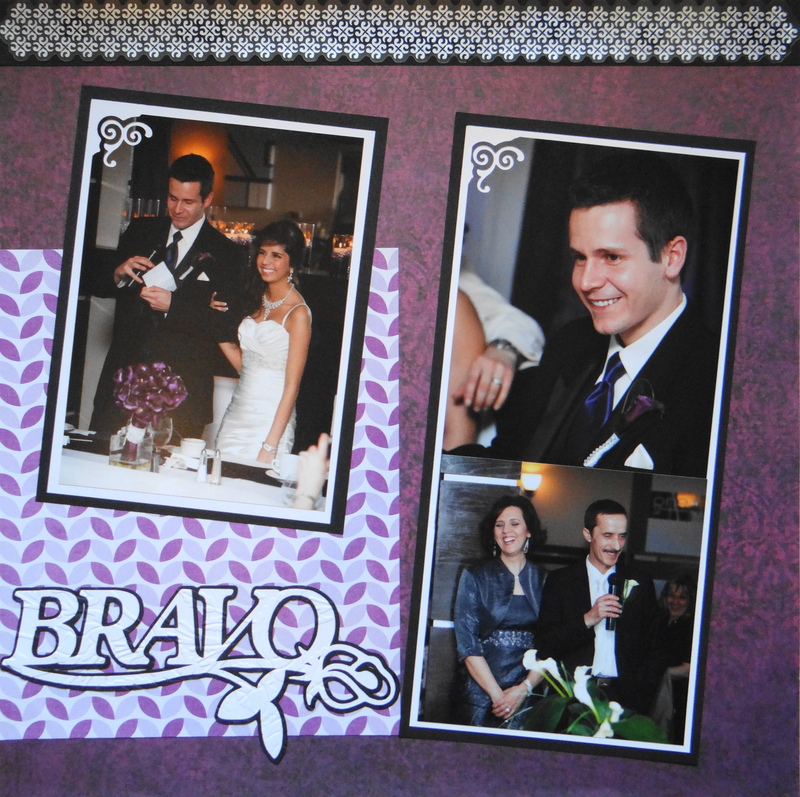 The microphone and title “Bravo” are from Cricut’s Quarter Note cartridge. 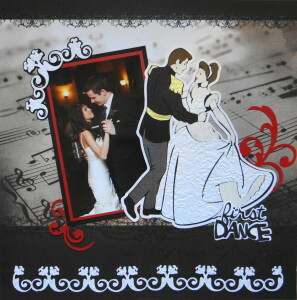 Inspiration: The bride & groom having their first dance. 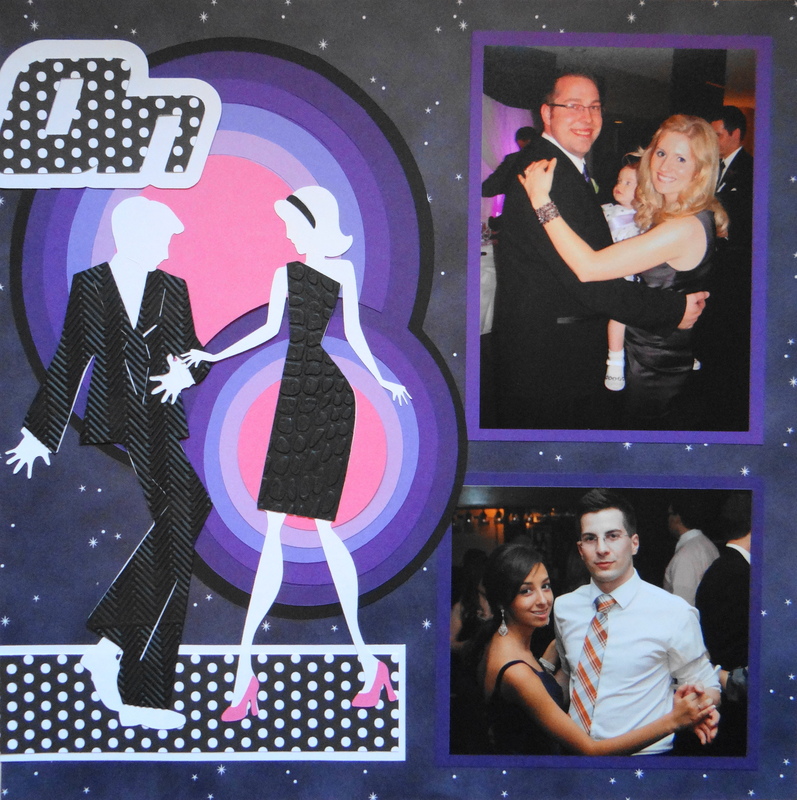 Inspiration: The guests dancing at the wedding reception. 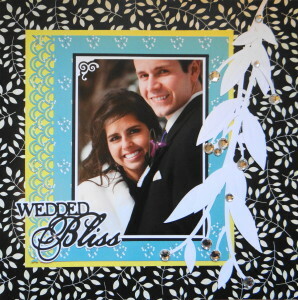 This paper is from DCWV Stardust Stack. 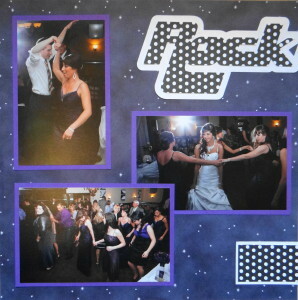 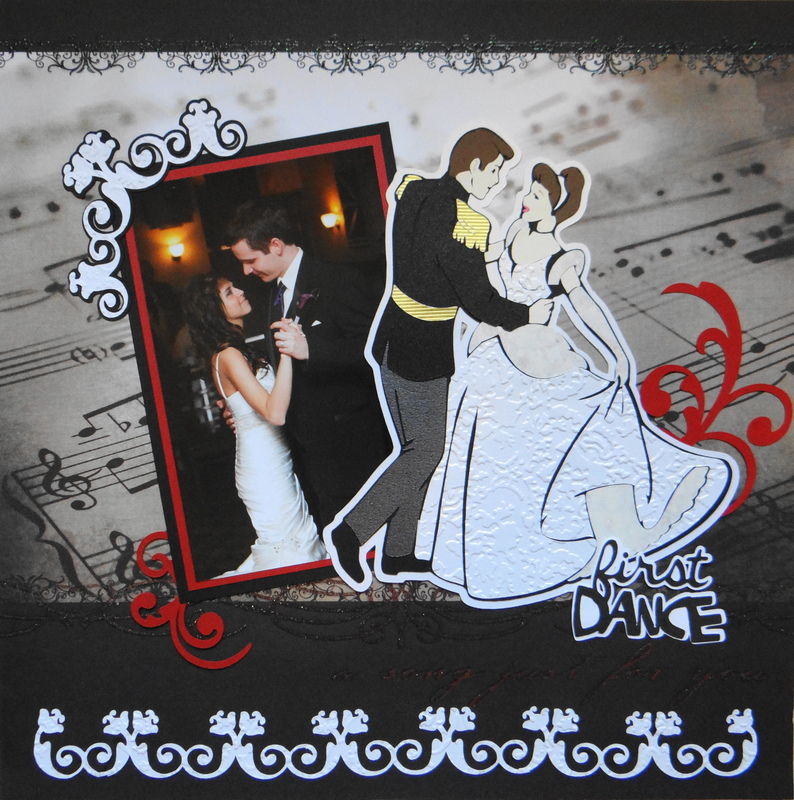 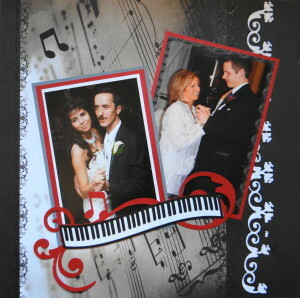 The title “Rock On” and the dancing couple are from Cricut’s Groovy Times cartridge. 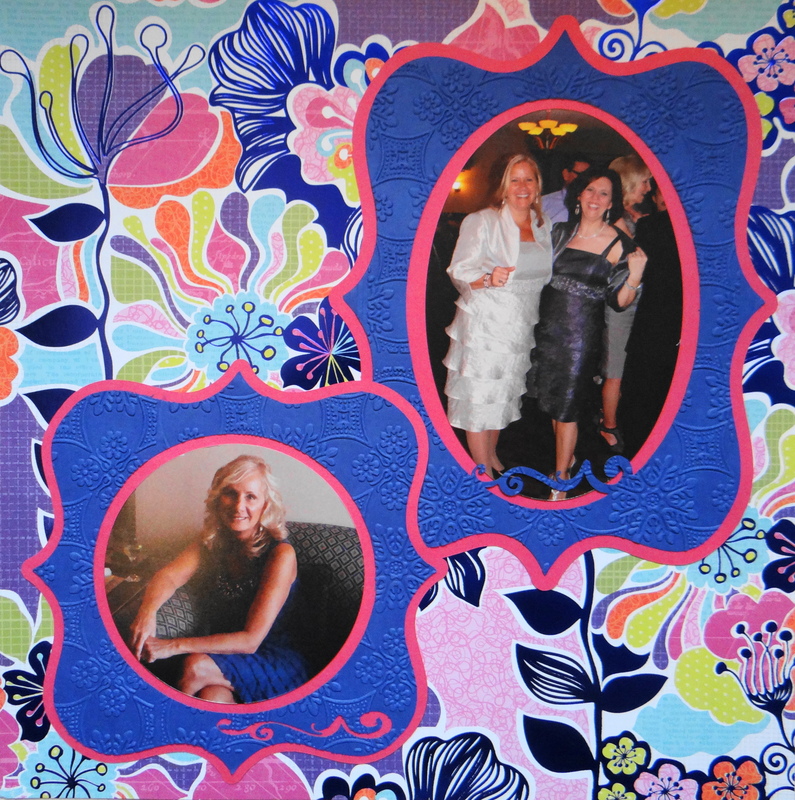 Inspiration: The colours of all of my sister’s dresses. 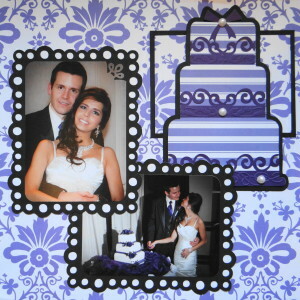 Inspiration: The bride & groom cutting the wedding cake.